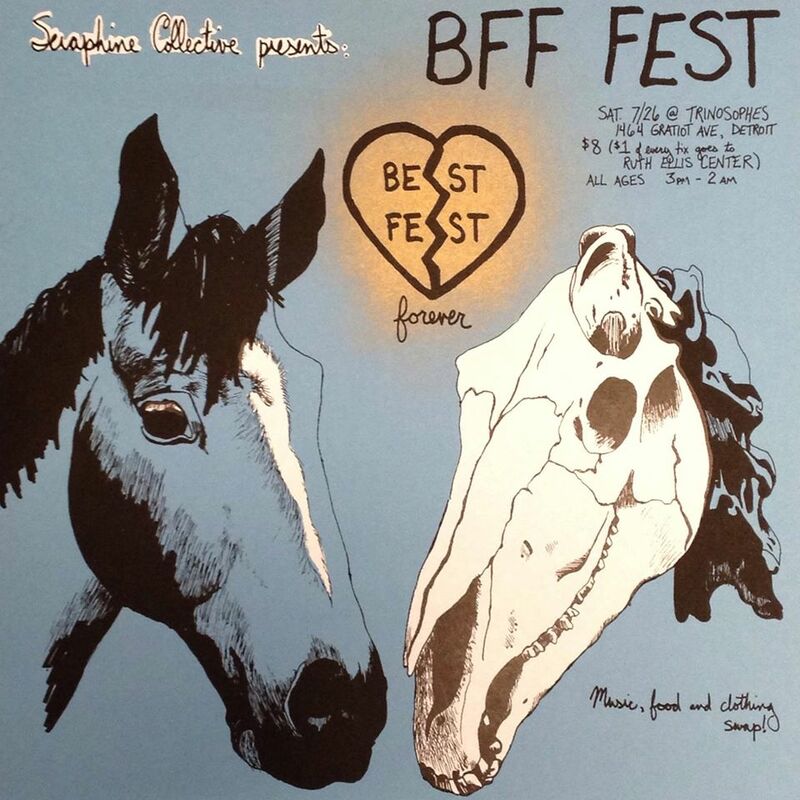 What’s the history of BFF Fest? 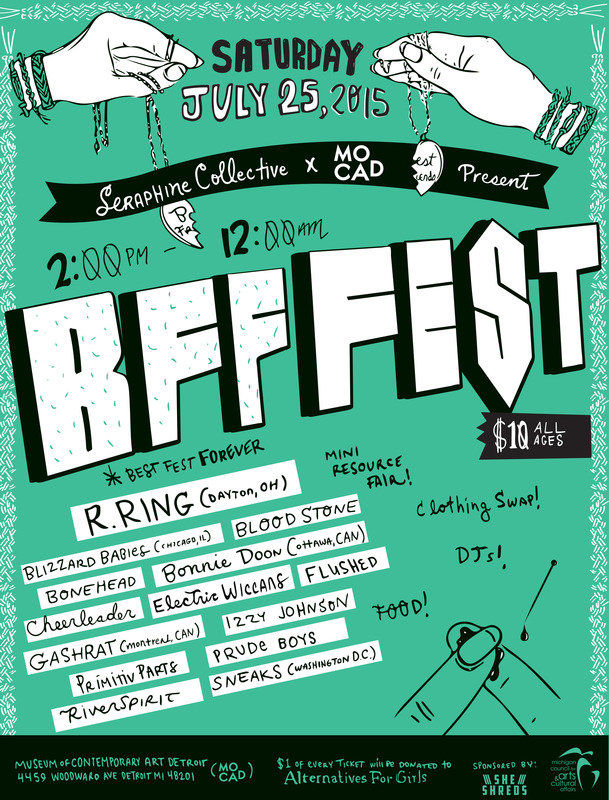 The first BFF Fest happened last year on July 26th, 2014 at Trinosophes in Detroit. A lot of us had been talking about starting a festival. It had been a long time dream to create a festival that prioritized the participation of people who are often underrepresented at festival and in the music scene in general – women, people of color, LGBTQ persons, etc. So we got together and did it! And thankfully people came out and it was a success. What are some things you learned post BFF 1? It never gets any easier, but it only gets more and more fun. Was it difficult coming up with a high female ratio while not using any of the performers from the original fest for BFF 2? Yes and no. We called on a lot of friends to fill the lineup for BFF 1. And we came to make a lot of new friends through last year’s fest as well. We did our best to reach out to bands we couldn’t invite last year as well as bands we’re not that familiar with this year. We also invited some sweet out of town bands to participate. So there are some brand new bands and some veteran bands and some non-Michigan bands and R.Ring (= Kelley Deal of the Breeders and Mike Montgomery of AMPLINE)! What’s different about BFF 2? BFF 2 has been both scaled up and scaled down in comparison to BFF 1. 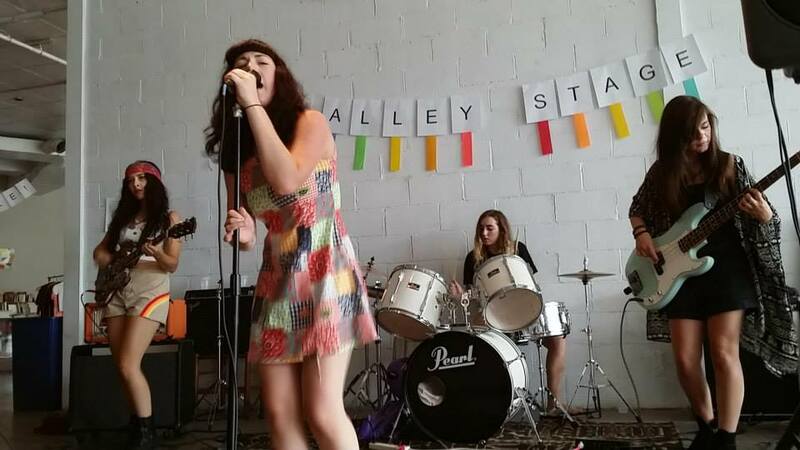 We have 6 fewer bands this year, but we were able to invite some out of town acts to play the fest including having a band like R.Ring headline this year. 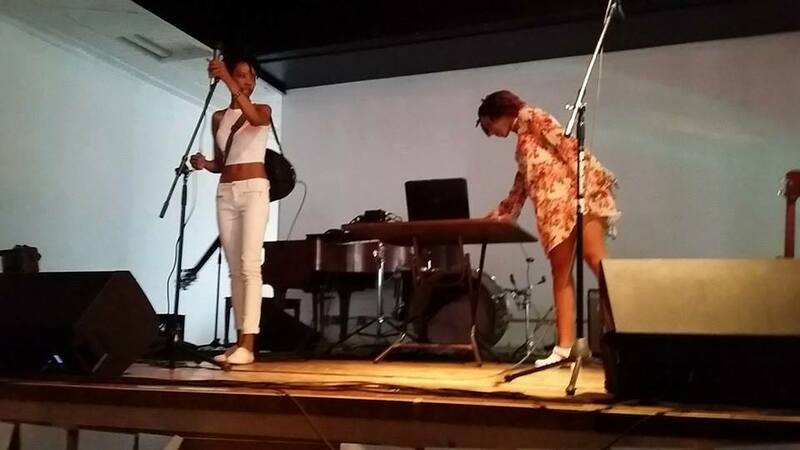 Thanks to a grant from the Michigan Council for Arts and Cultural Affairs (MCACA) we were able to budget for things we weren’t able to last year – things like Seraphine and BFF merch (t-shirts!) and all of the incidentals we prayed we’d be able to cover with door (and we were able to last year thank goodness)! This year we’re also having a Pre-Party on Friday night at the UFO Factory, and an After Party at Donovan’s. Can you tell us about the process of getting the Michigan Council for Arts and Cultural Affairs and what the grant helped you do? We first heard about the grant from a friend in grad school who had received a larger grant from MCACA for Youth Arts Alliance. The process of applying for the grant was a team effort. It was kind of overwhelming at first, being our first grant application, but we all worked together to get it done and it turned out to be a really rewarding experience (in more ways than one). The funds from MCACA will enable BFF Fest to reach out to more communities in the greater Detroit area in an effort to increase the diversity of our audience. Music festivals are places of interaction and performance spaces act as networks bridging groups and crossing boundaries between musicians and audience members they draw together, and the information and ideas they share and generate. What are you most excited for and what are you most nervous about with BFF Fest 2? We’re excited to have an Art Show this year! The art-show is happening the day before the actual fest. It took a bit more stress and planning on our part to put it together, but we’re really happy that we can give proper spotlight to some truly amazing artists in our city/state. We also had more opportunities to raise more money for charity this year, which is really wonderful. BFF 2 will be benefiting Detroit’s Alternatives for Girls, a 501(c)3 nonprofit serving homeless and high-risk girls and young women. We’ll be donating $1 off of every ticket just like last year, but we’re also having a raffle to raise money to buy items that Alternatives for Girls regularly needs like hygiene products and undergarments. R.Ring will be donating signed posters and Seraphine will be throwing in some fest t-shirts and the like. The legendary Alice Bag who is playing the Pre-Show is also donating a signed copy or two of her new book. We’ve also asked some local businesses to donate prizes as well. Having BFF 2 in a place as awesome as MOCAD is amazing. They’ve given us an incredible level of support that has allowed us to really upgrade the festival. At the same time, we’re a little nervous about this level up. The stakes seem a whole lot higher now. Tell us about the charity you’ve chosen to donate $1 of every ticket to this year. Alternatives for Girls is a Detroit-based 501(c)3 nonprofit serving homeless and high-risk girls and young women. They offer a Prevention Program (pregnancy, gang involvement, drug/alcohol, school truancy), Shelter Program (providing a stable home, counseling and life skills), Outreach (helping girls/women to understand high-risk activities and transition into safe/healthy choices) and a Resource Center (connects people in need with the organization that can provide assistance). For the 13th year in a row, 99% of the young women in AFG’s Prevention Program old enough to graduate from high school not only graduated, but went on to college. They’ve served more than 105,000 at-risk girls, women and families and provided 112,294 nights of care to homeless women and their children. Did your hearts stop a little when R. Ring (Kelley Deal) said yes? Oh yeah. We couldn’t believe it! We’re incredibly honored that they’re kicking off their summer tour here in Michigan at BFF Fest. Mike and Kelley have been unbelievably generous with their time, answering interview questions (look for it in the BFF Zine! ), sending a track for our mixtape (thank you Misra Records! ), and providing items for the raffle. We could not have asked for cooler headliners. Any advice for other people putting on festivals? Prepare to be exhausted! It takes a lot of work to put on a festival. One task suddenly turns into five which turns into 25..! There are so many things to think about. Too many. But it’s all worth it. Get yourself a good team of friends and put on the fest that you yourself would want to go to. Keep your standards high and don’t freak out. It may never feel like it, but things will be ok.
There’s a pre-fest art show at the UFO Factory along with some special guests. Tell us more. We’re finally having an art-show! I was pretty disappointed that we couldn’t include one last year, but we made it happen this year! We’ve gathered some of Michigan’s finest artists to show their work for a whole month at UFO. All of the artists will also be featured and interviewed in BFF Fest zine which will be available at the pre-show. Bring your wallets! Artwork will be up for sale at artists’ discretion (all profits go to the artists). For a “little bit of night music,” we’ve invited three of last year’s fest bands – Rebel Kind, Double Winter, and Seraphine membered band Casual Sweetheart to play alongside Brooklyn based band Sharkmuffin (who played Seraphine’s March Residency Show). We’re also extremely honored to have the legendary Alice Bag of The Bags (a first generation punk band that kicked it with the Cramps in LA) read from her new book “Pipe Bomb for the Soul” and play some songs with her band! What’s next for the Seraphine Collective? We’re in the process of becoming a non-profit right now. Next up: more shows, zines, and mixtapes, along with fundraising and getting our record label off the ground. Will there be a BFF Fest 3? CLICK HERE TO GET ALL OF THE DETAILS ABOUT BFF FEST 2! !